The acquisition of FSLogix promises to ensure Microsoft Windows Virtual Desktop service loads fast. Microsoft has acquired FSLogix in a move to ensure that its new Windows Virtual Desktop (WVD) service delivers suitable performance. Microsoft isn’t disclosing terms of the deal, but FSLogix will bring technology to ensure that virtual Windows 10 clients and Office 365 apps, notably Outlook and OneDrive, load fast with Microsoft’s new desktop-as-a-service offering. Having load times that match traditional PC environments is a key consideration among prospective customers of VDI and virtualized app offerings. FSLogix is one of seven alliance partners that Microsoft tapped when it announced its Azure-based WVD service during the company’s annual Ignite conference in Orlando in September. WVD will become an option with the Microsoft 365 bundle, which includes Windows and Office subscription options, among other services. Experts believe there will be increased demand for partners and MSPs to deliver virtual desktop and app services in 2019. The introduction of WVD is a major attempt by Microsoft to offer a multi-user, cloud-based virtual Windows 10 desktop service that will compete with Amazon WorkSpaces. Consequently, WVD will also compete against Citrix Workspace and VMware’s Workspace One and other desktop-as-a-service (DaaS) offerings. 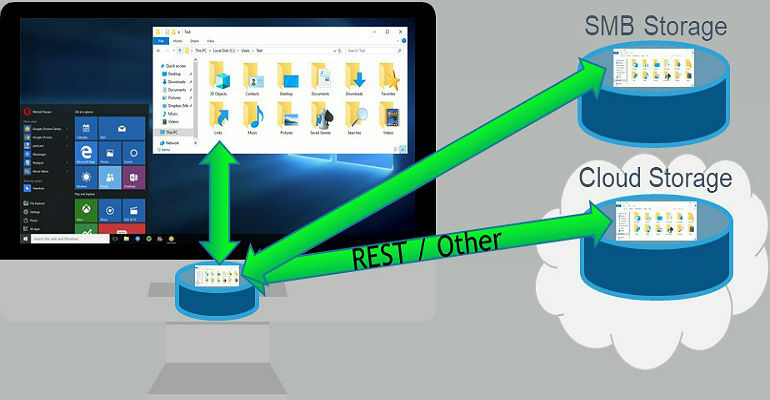 In order to provide a competitive, multi-user Windows 10 service, Microsoft needed an improved User Profile Disk (UPD). FSLogix offers user-profile containers and app containers that use what the company calls “image or application masking.” Another FSLogix product, Office 365 Container, is designed to accelerate performance of Office apps in virtual environments. In addition to offering an acceptable user experience, Microsoft’s improved UPD will make it easier for partners and MSPs to provision and manage WVD. “FSLogix solutions enhance customer experience and productivity, while reducing support requirements for IT departments,” said Microsoft corporate VPs Brand Anderson and Julia White, in a blog announcing the acquisition. Partners delivering cloud-based virtual desktop services will need to assure customers that they won’t experience degraded load times. Liquidware’s Smith believes the acquisition will help make WVD competitive, but it won’t necessarily have all the user-environment management extras offered by Citrix, VMware or his company’s ProfileUnity, which “can take that take a profile and go even further,” Smith said. It’s critical, though, that users will always have a new machine with WVD every time they log in. “If you have a user-profile disk or container either with FS Logix, it’s a VHD, or with our feature a VMDK, it’s read at a block level so it’s read very quickly and gives you a great user experience,” Smith said. Microsoft hasn’t said whether it plans to offer FSLogix technology outside of WVD or Microsoft 365, but Smith hopes that’s the plan. Besides Microsoft, FSLogix’s key alliance partners include AWS, Citrix, Red Hat and VMware. In addition to its user-profile container and Office 365 container, FSLogix offers Windows License Management and Java Redirection software.